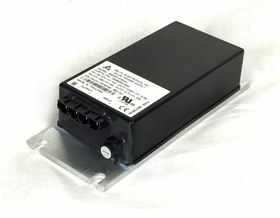 Model 1420 Converter is rated for 300 watts max. 18-106v actual allowable voltage input. ***Note: the converter is rated for 106v max continuous voltage, or 10 min max up to 126v as in the spec sheet below, so some 96v systems may be affected by this depending on your battery chemistry and state of charge.